As Warner Bros. prepares to launch their new superhero-branded streaming platform DC Universe, they're starting to unveil new details for a revived fan-favorite series. The animated series Young Justice is returning for Season 3, being dubbed Outsiders, and now fans have an idea of which heroes will be returning for the new episodes — as well as some fresh faces joining the Team. It looks like they're playing up Black Lightning's role in the new team, which is a no brainer given the character's resurgence in popularity thanks to The CW series. In the comics, Black Lightning helped Batman create the team of the Outsiders, so this is a logical step for the series. Returning faces include Superboy, the former Artemis now known as Tigress, Nightwing, and Black Lightning. The new characters include Metamorpho and Katana, prominent members from the comic book team, as well as some new faces that we can't identify at this point. But that's not going to stop us from speculating over who they are. The woman flying could be Lightning, given her proximity to Black Lightning in the photo, and Lightning's own role in the Outsiders. The character with the green costume could be an updated take on Geo-Force, which seems likely given the prominence of the head-sock. But one character is particularly intriguing. The six-limbed alien character could be a new addition for the DC Universe, or it could be a radically different take on a pre-existing character. Based on the costumes, the character seems to have a similar design to the characters who appear to be Geo-Force and Lightning, though there are also some interesting resemblances to a cult-favorite character — Ambush Bug. Sure, Ambush Bug is most recognized in his green costume, but the goggles and the lines on the mask make it seem like it could be an updated take on the character. 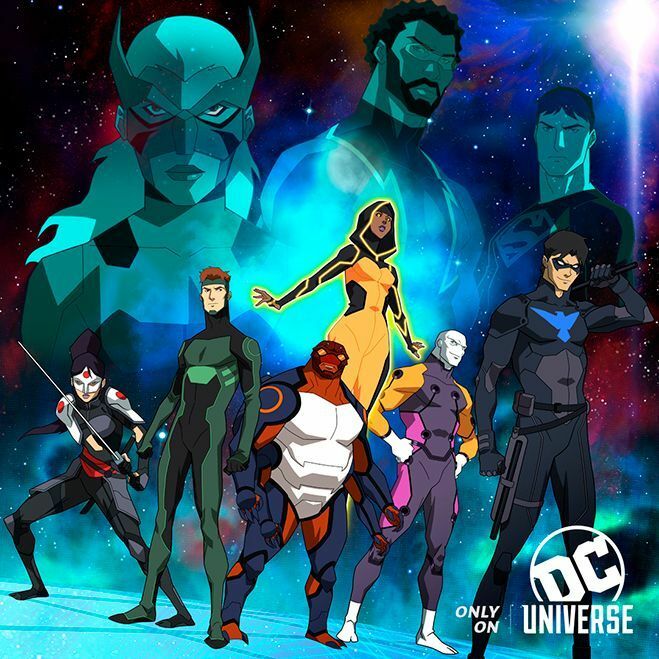 With Young Justice Season 2, AKA Invasion, delving deep into alien territory, an alien crime fighter on Earth could be one of the holdovers from the events of the Light's machinations. Hopefully we learn more about these new characters in Young Justice: Outsiders, as well as see some more familiar faces, in the coming weeks. Young Justice: Outsiders will air on DC Universe, which is rumored to launch later this year. Are you excited for this interesting new take on DC's animated heroes? Let us know in the comments!